"The essays collected in Teaching the Works of Eudora Welty seek to move Welty beyond a discussion of region and reflect new scholarship that remaps her work onto a larger canvas. The book offers ways to help twenty-first-century readers navigate Welty's challenging and intricate narratives. It provides answers to questions many teachers will have: Why should I study a writer who documents white privilege? Why should I give this "regional" writer space on an already crowded syllabus? Why should I teach Welty if I do not study the South? How can I help my students make sense of her modernist narratives? How can Welty's texts help me teach my students about literary theory, about gender and disability, about cultures and societies with which my students are unfamiliar?" 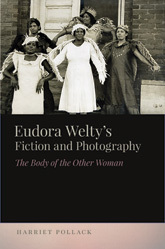 "Drawing on the context in which the protection of the white female body is symbolically linked with guarding the U.S. southern body politic, Harriet Pollack traces a pattern in Eudora Welty’s fiction in which a sheltered middle-class daughter is disturbed or delighted by an other-class woman who takes pleasure in “making a spectacle” of her corporeal self. Welty herself seeks a parallel self-exposure both through these stories that pair protected girls with at-risk flashers and through her photography’s innovating representations of the black female body. Welty’s escape from sheltering continues when, after finding herself in love with a man unwilling to acknowledge his homosexuality and so sharing the silence of his closet, she varies the plot of the other woman in a series of midcareer fictions." "From the heartbroken protagonist she depicted in her first published story, “Death of a Traveling Salesman,” to the reflective widow she described in her last novel, The Optimist’s Daughter, Eudora Welty wrote realistically about the shadows and radiance of love. In a meticulous exploration of this theme, Sally Wolff combines new readings of Welty’s fiction with biography and contextual information drawn from Wolff’s nineteen-year friendship with the author. A signature image in most of Welty’s fiction, the rose imparts symbolic power as it places Welty in the age-old tradition of love literature. Wolff argues that the dark rose—from the height of its brilliance to the end of its life—serves as a deft metaphor for the dichotomies Welty presents, equally suggestive of beauty and sadness, and the comic, tragic, and mysterious qualities of love. While some of Welty’s characters are clearly autobiographical renderings—a daughter remembering her parents’ marriage, or a broodingly hopeful member of a large family wedding—at other times, Welty analyzes from afar the dynamics of successful and troubled loving relationships. Although Welty fell in love more than once during her life, she never married, and Wolff argues that writing from the vantage point of the unattached gave Welty an objective perspective from which to examine in her fiction the varied dimensions of love." 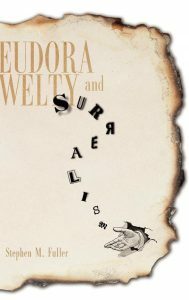 "Eudora Welty and Surrealism surveys Welty's fiction during the most productive period of her long writing life. The study shows how the 1930s witnessed surrealism's arrival in the United States largely through the products of its visual artists. Welty, a frequent traveler to New York City where the surrealists exhibited and a keen reader of magazines and newspapers that disseminated their work, absorbed and unconsciously appropriated surrealism's perspective in her writing. In fact, Welty's first solo exhibition of her photographs in 1936 took place next door to New York's premier venue for surrealist art. In a series of readings that collectively examine A Curtain of Green and Other Stories, The Wide Net and Other Stories, Delta Wedding, The Golden Apples, and The Bride of the Innisfallen and Other Stories, the book reveals how surrealism profoundly shaped Welty's striking figurative literature. Yet the influence of the surrealist movement extends beyond questions of style." "Faced with Eudora Welty's preference for the oblique in literary performances, some have assumed that Welty was not concerned with issues of race, or even that she was perhaps ambivalent toward racism. This collection counters those assumptions as it examines Welty's handling of race, the color line, and Jim Crow segregation and sheds new light on her views about the patterns, insensitivities, blindness, and atrocities of whiteness. 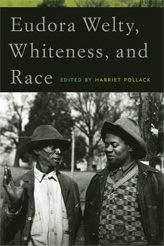 Contributors to this volume show that Welty addressed whiteness and race in her earliest stories, her photography, and her first novel, Delta Wedding. In subsequent work, including The Golden Apples, The Optimist's Daughter, and her memoir, One Writer's Beginnings, she made the color line and white privilege visible, revealing the gaping distances between lives lived in shared space but separated by social hierarchy and segregation. Even when black characters hover in the margins of her fiction, they point readers toward complex lives, and the black body is itself full of meaning in her work. 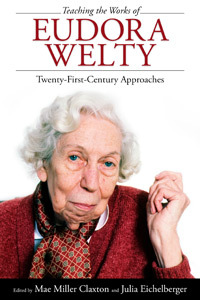 Several essays suggest that Welty represented race, like gender and power, as a performance scripted by whiteness. Her black characters in particular recognize whiteface and blackface as performances, especially comical when white characters are unaware of their role play."